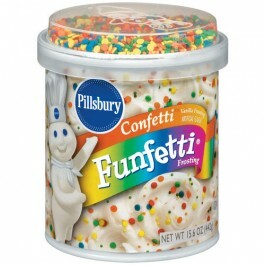 Pilsbury Vanilla Fudge Confetti Funfetti Frosting to make your cake, cookie or brownie even more delicous. It's easy, creamy and fun! Sugar, Water, Partially Hydrogenated Soybean and Cottonseed Oils, Corn Syrup, Contains 2% Or Less of Each of The Following: Corn Starch, Salt, Sodium Acid Pyrophosphate, Mono- and Diglycerides, Natural and Artificial Flavor, Polysorbate 60, Modified Corn Starch, Potassium Sorbate (Preservative), Soy Lecithin, Citric Acid, Artificial Color. Candy Bits: Sugar, Rice Flour, Modified Corn Starch, Partially Hydrogenated Cottonseed and Soybean Oil, Corn Starch, Confectioner's Glaze, Cellulose Gum, Carrageenan, Soy Lecithin, Colored With [Yellow 6, Yellow 5, Blue 1, Red 40, Blue 2 Lake], Gum Tragacanth, Gum Arabic, Artificial Flavor, Carnauba Wax.